It is generally accepted that the use of a bow to vibrate a string on an instrument originated in the Middle East well before it became known in Europe. It is also generally accepted that the most plausible explaination for the migration of this technique is the cultural sharing that occurred during the Crusades. One little bit of archaeology tries to get in the way of this explaination, however. The bowed lyre, most especially the instrument family known as Talharp (tail-harp, harp strung with horsehair strings) might have existed before the Crusades, and in the Baltic region closer to actual migration and trade routes of the Middle East. This instrument has a long history among the Karelian peoples, though little is known about when it first appeared. As an enigma, it is interesting to try and decipher a whole story by using pieces collected by each of the individual Baltic peoples. We base our instruments on archaeological evidence, historical art and written documentation, but we do not replicate these instruments. Instead, we choose to take what we know from these sources and our own experience, mix in the imagination of the customer, occasionally add in a drop of technological magic, and create what a lyre builder of this era would have created, a unique piece for his client. So drop us a message or give us a call. We promise, we won't charge to answer your questions. Possibly the most common, not necessarily the earliest, but the instrument that most of today's Jouhikko are based on in form. 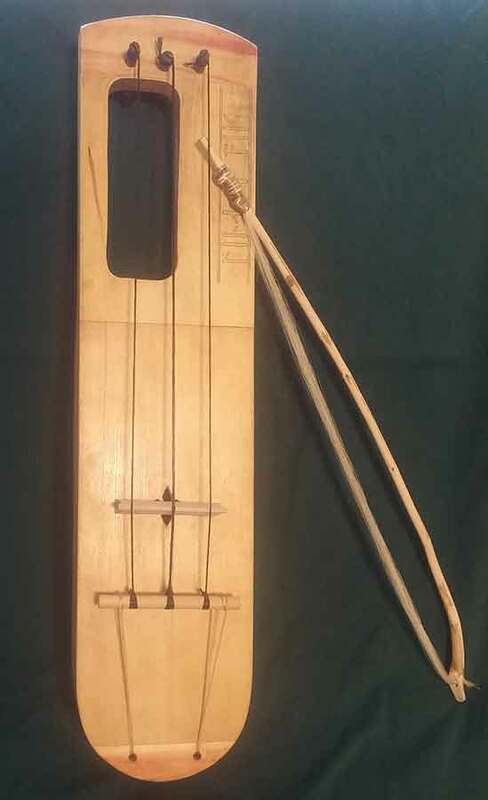 Very simple and rustic, or polished and professional, with two or three strings, this combination of unbraced, flat top, horsehair strings and a horsehair bow, and stopping the strings in air with the pads or backs of the fingers gives this instrument a mystical sound unique from any other. A form that comes naturally from a limb of a tree, similar to the way rebecs were made, this style seems somewhat more refined. For those whose aesthetics tend towards curves, this instrument delivers. Usually deeper than the box bodied instruments to adjust for soundbox volume, this instrument could be fitted with a slightly curved top, which gives it some slight tonal differences from it's flat-topped brothers. Also available in 2 or 3 strings. This form of lyre, inspired by the player in the stone carving at the entryway to Trondheim Cathedral, is my interpretation of one of the earliest graphically documented Jouhikko (Haar-gie in Norway). This large, deep square body with a rounded end allows wide string spacing, a generous outer window frame, and has a more robust but primitive sound. Also available in 2 or 3 strings. While many non-Baltic peoples adopted a variant of the talharp, the Welsh developed a unique instrument of their own. A round ended 3 string lyre with an integral fingerboard, this instrument was strung in gut. The flat bridge and flat fingerboard mean that the instrument was played either only on the meldoy string or triple-stopped (all 3 strings together). The Crwth Trithant (three stringed crwth) was replaced fairly early with a six stringed variant, the instrument that the modern Crwth is based on. One feature that may have significant historical meaning is the design of the bridge. Because of the width and the unbraced nature of the soundboard of these instruments, string tension tended to buckle in the soundboards. The Crwth builders solved this in a very unique manner. The bridge is made with one foot much longer than the other - this long foot goes through the soundhole in the soundboard and rests on the back of the instrument. This effectively allows the entire instrument to share in the string tension load. But as a consequence, bridge vibration is now channeled to both the soundboard and back of the instrument. This increases volume, projection, and tone, and might have been the model for the modern viol family soundpost.